Mounafanyi Pan-African Percussion and Dance is comprised of performers from all over the world, and it's coming right here to you at Hochstein at High Falls. Come enjoy lunch and a crazy beat that is going to make you want to get up and dance! 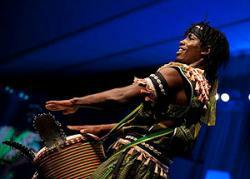 Rochester’s only Pan-African performing group, Mounafanyi Percussion and Dance Ensemble features musicians and dancers from Guinea, Ghana, the Congo, the Ivory Coast, and the United States. Their performances weave incredible drumming sequences – including West Africa’s iconic djembe hand drum – together with high-energy dance to create a spectacular tapestry of movement and sound. The group is led by Artistic Director Kerfala “Fana” Bangoura, a long-time member of Guinea’s most prestigious national performing groups – Les Ballets Africains and Les Percussions de Guinée – who also teaches drumming and dance at the University of Rochester.